No one sets out to have a content distribution fail. Even the word loser is enough to evoke painful memories that may date back to childhood. But face the stark reality that content distribution makes or breaks your content marketing success. Without a distribution plan, your loving investment in content creation is wasted since your content goes unnoticed. 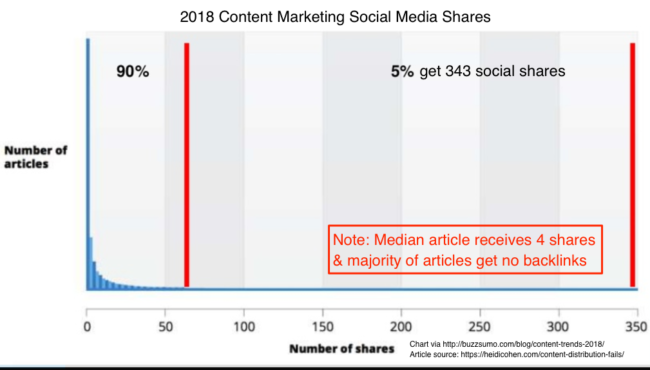 While it’s based on a small sample, Ian Cleary’s recent Outreach Plus research found that 90% of content marketers have content distribution problems. 65% don’t have time to distribute their content. Ouch—you need editorial calendars to keep content projects on track. 25% don’t know how to distribute their content. Yikes—even the most basic email and social media delivery yields results. Fret not, we’re here to help you. 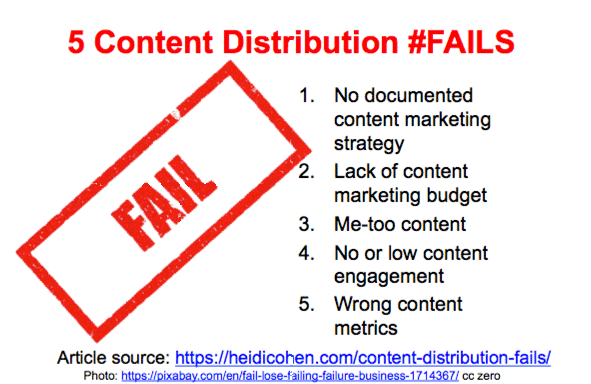 In total, there are 5 core content distribution #fails. While they may dress up as other types of issues, don’t let that fool you. Once you recognize them as distribution problems, you can start to fix them. As a result, your content distribution will start to reap better results. 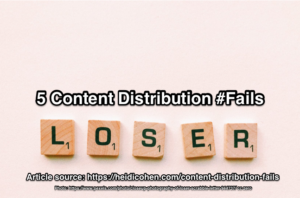 Regardless of your current position, you probably face one or more of these content distribution #fails. Even worse, you’re responsible for driving measurable content distribution results even if the content you receive is sub-par. While you may not think that you fall into this category, chances are you’re not being honest with yourself. Although you have a vague content marketing strategy safely stored in your brain, it’s neither documented nor distributed within your organization. As a result, it can change or be misinterpreted by others. No content mission statement. Can result in unnecessary content creation. Don’t know your target audience. While you know something about your prospects you don’t have the key data for content creation and distribution. Missing brand and social media and guidelines. As a result, your inconsistent messages waste efforts. No editorial calendar. Therefore you don’t create a mix of the 5 core types of content. As a result you create extra content, me-too content, and/or poorly timed content. Lack distribution calendar. Based on editorial production, it defines when and how to deliver new and existing content over time. Includes re-promotion, updates and transformation to maximize content lifetime value and reduce content creation. Defined content distribution guidelines and distribution channel plans. Outline your key distribution channels and delivery frequency. 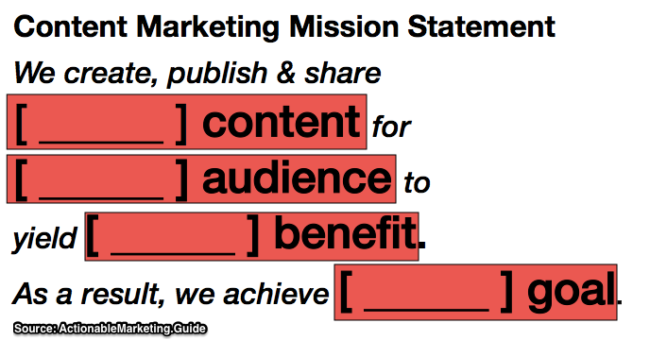 Also, align distribution with your content mission statement and branding guidelines. Although your management may buy into content marketing, they don’t provide sufficient resources to achieve measurable success. Like other business activities, content marketing requires resources (CMI/MarketingProfs Research 2017). Average content marketers allocate 26% of their marketing budget to content marketing. By contrast, best-in-class content marketers allocate 40% of their marketing budget to content marketing. Social media is “free.” The Google (including YouTube)-Facebook (including Instagram) duopoly hasn’t rid rational managers of this idea. To maximize organic social media reach, you need employee participation, shared creation, scheduling and monitoring tools. Siloed advertising. If social media and third party advertising are moved to a dedicated function, you might have to lose some content distribution budget and control. Reduced owned media use. If your company website, blog and intranet delivery are siloed resources, then content marketing distribution may be limited. Limited housefile access. When a non-marketing department controls email use and priorities, content distribution reach is limited. Tap into the power of sales. You can reduce the sales time spent creating their own materials if they distribute content directly to their contacts. Place relevant content in customer service and purchase emails. Give content to people who actively seek or need it. Post relevant product and FAQ content on product pages. As a result, expand your content entryways. Provide content for human resources. In the process, persuade potential hires to join your team at no extra cost. Exploit management presentations. Increase low cost content reuse. While at SAP, Michael Brenner use this tactic to develop crowd-alluring information. To stand out in a content saturated world, deliver value to your target audience. Understand and meet your audience’s content wants and needs. As a result you can deliver it when, where and how they want to consume it. Translation: Your content won’t attract social media attention or yield search juice. Didn’t vet content ideas. Before creating content, check that it will stand out. Don’t appear on search. 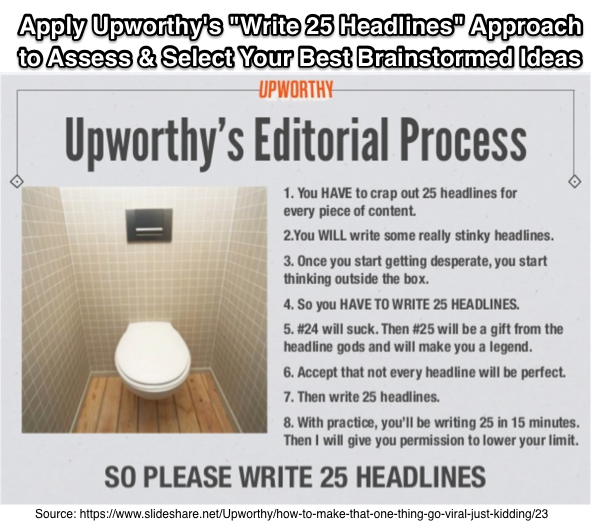 Do your keyword research before publishing your content. Lacks influencer input. 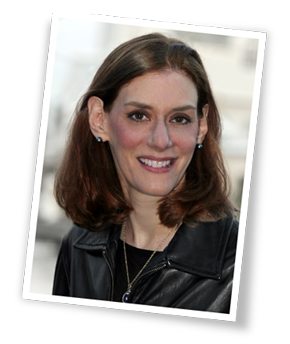 Do you miss the opportunity to build and deepen influencer relations? This is heartbreaking since it has no cost! Shopify Plus’s Aaron Orendorff never creates content alone. Instead, he gets input from thought leaders. Later they share the content. Not formatted for easy human consumption. Let your audience read your information on their schedule. Further, allow them to use their chosen device and favorite content format. Headline is an afterthought. Select the best one after generating at least 25 options. Find out customer service’s most frequently asked questions. Create content that your audience actively seeks. Then share it with customer service after publication. CoSchedule’s Nathan Ellering used this method to develop some of his best performing articles! Write “Who We Don’t Want For A Customer.” Marcus Sheridan claims it’s a revenue generator since everyone wants to belong. By itself engagement data isn’t enough to assess your content marketing results. But it provides a good early indicator of audience appeal. From a content marketing perspective, this issue hurts because you’ve done the hard work of getting people to your content but they leave without doing anything. Even worse, you may not be responsible for this. Slow website load time and lack of responsive design. These factors hurt search results. Even worse they cause potential visitors to leave. Extreme gating. Based on my clients, this results from poor marketing and sales integration. Instead, capture minimal information and vet prospects later. Alternatively use persistent chat. Don’t offer visitors the communications options they want. Focus on your audience’s desired options, not yours. Also post your office and social media hours. Based on Hubspot research, prospects use social media, video conferencing and messaging. Show your face. People do business with people. Show who’s behind your firm, regardless of size. Piggyback on social media customer service. Ask employees already engaged on social media to help distribute content. Participate in existing communities on social media. Use options like Facebook Groups, LinkedIn Groups, TwitterChats Reddit, Quora and Slack. Almost every content marketer has gotten the memo: “Prove ROI to continue getting budget and resources.” As a result, they measure something. Instead, add trackable URLs and a way to measure results when you create and optimize your content. Without this planning, you won’t have the right content marketing metrics. Further, direct visitors to take the next step in their journey. To help them use connected content. This includes landing pages, about us, contact us and subscribe forms. If you leave this to chance, they’re gone! No trackable metrics built into your content. As a result, you have whatever metrics exist. Based on my experience, this data is too general to be useful. 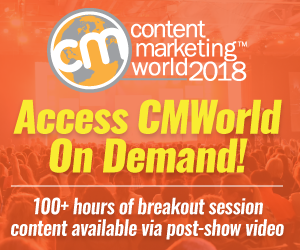 No next step or connected content. Visitors have no guide and are left with no direction. 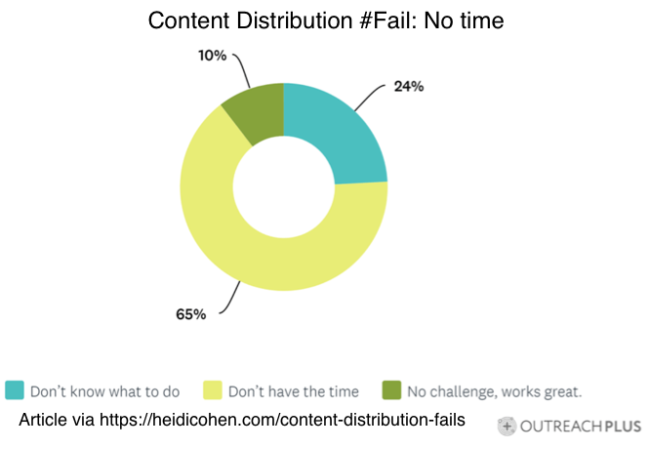 Your content distribution doesn’t have to fail! You have the power to control your content distribution destiny. To avoid a content distribution fail, build content success into your content before you create your content. Get your company colleagues and personal network involved to help you. Engagement makes everyone happy! Don’t be overbearing or mean since no one likes to deal with the Content Grinch. Instead transform your content distribution #fails into win-win opportunities. Go ahead, surprise yourself and just take one step after another towards content marketing success. Tags Aaron Orendorff, Andy Crestodina, BuzzSumo, Ian Cleary, Marcus Sheridan, Michael Brenner, Nathan Ellering. Bookmark the permalink.